A new refrigerator can work wonders to bring any kitchen to life while helping to achieve health goals. Newer models often come fully equipped with filtered water dispensers, allowing you and your entire family to access fresh, cold water and stay hydrated more easily. Plus, a newer model will likely have more freezer space, making it easier to meal prep while keeping foods at maximum freshness levels. While the newest refrigerator models come in varying neutral shades, metal and stainless steel finishes provide the most modernized look and are the most popular. This makes sense considering that stainless steel is one of the four most common types of metal used in the U.S. construction industry (the other three are carbon steel, aluminum, and copper). The bottom line? A new refrigerator may not be cheap, but it’s a long-term investment that provides a modern look and makes health goals more attainable. “Choosing contrasting colors — or at least tones, if you’re not into the monochromatic look — will help you add a huge amount of visual interest to the kitchen. When you’re putting together the color palette, go with either one neutral shade and one bold color or choose a warm and cool shade,” writes Tara Mastroeni. Finally, while functionality should definitely be a priority in any kitchen remodel, make sure to keep the overall feel and atmosphere in mind as well. This goes beyond choosing the right colors and finishes for countertops and appliances; rather, it’s adding the elements needed to make your kitchen space feel cozy and comfortable. Add some personalized art pieces to the walls, hang up some of your favorite photos on the refrigerator, and do anything else that will make your kitchen a place you want to spend time in. Another idea? Re-evaluate the lighting in your kitchen — both natural and artificial. Interior designers recommend updating a room’s decor every five to 10 years as it is, so any outdated windows or lighting fixtures, when replaced, can bring the space to life. 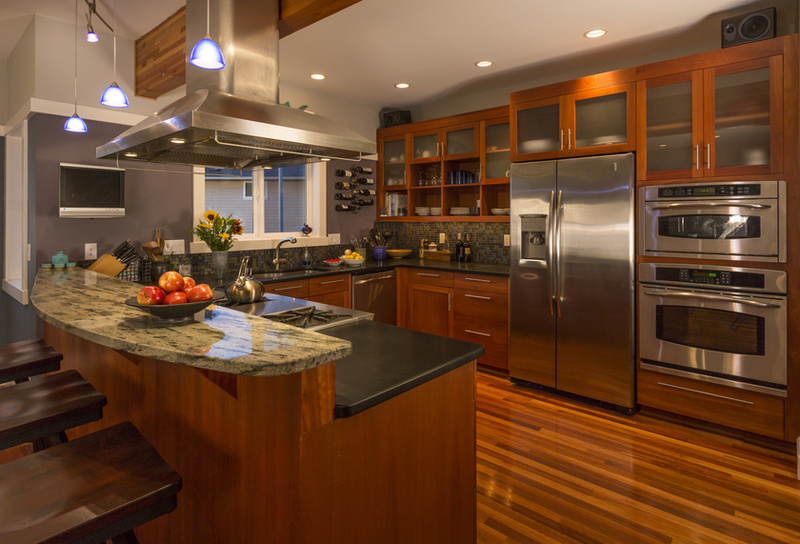 These kitchen remodel ideas can definitely help to achieve health goals, but they’ll also boost your home’s resale value. Realtor.com predicted that 61% of homebuyers in 2017 would be under age 35, and many of today’s younger homebuyers continue to prefer modern spaces. When you’re ready to move, you’ll get your investment back in no time. Take a look at your kitchen to think about the health improvements that are possible.